It is lovely to be invited to dinner. Tonight our gracious hosts fed the many kiddos first and then sent them off to play while we enjoyed an adult dinner in peace. Brilliant! Why didn’t I think of that? We were served this elegant Coq au Vin from Sunset Magazine. I contributed dessert. I don’t make these Vegan Chocolate Cupcakes because they’re vegan. I make them because they’re delicious and very, very moist. And today I made them because my friend who invited us to dinner can’t eat eggs or dairy. The recipe is originally from Epicurious. I scaled it down because a dozen big chocolate cupcakes seemed adequate for two families. 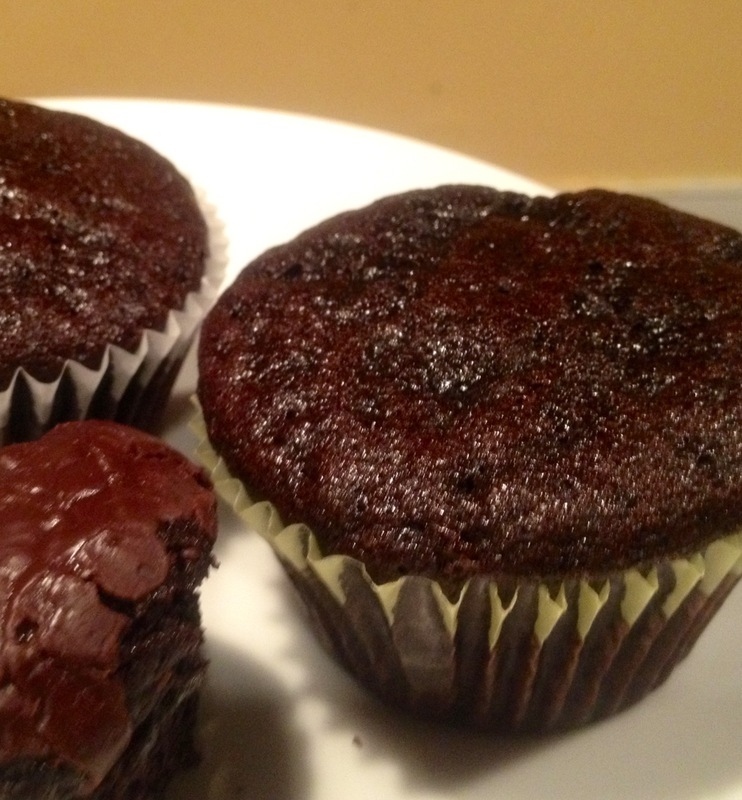 Also, did I mention how easy it is to make a dozen Vegan Chocolate Cupcakes? Mix 1 c. plus 2 Tb. flour with 1 c. sugar, 1/2 c. cocoa powder, 1 tsp. of baking soda and 1/4 tsp. salt in a big bowl. Get out a 2-cup measuring cup and mix 1 c. water, 1/3 c. canola oil, 1 1/2 tsp. vanilla and 1 tsp. white vinegar. Mix the wet ingredients into the dry ingredients, divide between 12 lined muffin cups, and bake at 350 for 20 mins. The wonky-looking bit of frosted cupcake you see in the picture up there is glazed with 1 c. powdered sugar sifted with 1/4 c. cocoa powder with 3-4 Tbsp. boiling water mixed in (just enough to make it pourable, then you dip the tops of the cooled cupcakes in). This entry was posted in Baking, Cakes, Desserts, Vegan or Would-Be-Just-As-Good-Vegan and tagged baking, chocolate, cooking, dessert, recipes, vegan on January 8, 2012 by emmycooks. Can’t wait to make these for my vegan mother! Thanks! These are incredibly moist; thanks for adding them into our lives. Yes, that should be fine. I also like baking with olive oil, which you could try if you like the idea of that flavor combination! Enjoy!